cal science in helping the life of some other lad similarly af­flicted, his remains were brought to Rockingham to the home of his father.. 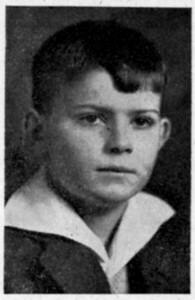 The funeral was held Wed­nesday afternoon, Jan. 22nd at 3 o’clock from the Episcopal church, of which he was a very devoted and loyal communicant. The minister was Rev. Ralph Bridges, rector of the Church. Rev. Howard Hartzell was to have assisted, but was detained by a death in his own congre­gation at High Point. Mr. Hart­zell was Ike’s first rector and baptized him and was a long­time friend of the family. Just before the funeral party left for the church, a brief pray­er was said by Rev. B. B. Slaughter with the family be­side Ike’s casket. And then to the church. The church was much more than filled with kindred and friends. The vested choir, of which he was a member in years past, sang hymns he liked—and appropriate to such a young fellow. “Onward, Christian Soldier,” “Stand Up, Stand Up, for Jesus,” and “Jesus Tender Shepherd Hear Me.” This last little hymn was sung by him so many times as a little boy in Sunday School—for after all he was in spirit, if not in years, just a little boy grown up. The pall-bearers were Ber­nard and Clem Wright of Greensboro, Jack and Henry Jerome of Pittsboro—his four first cousins ; Everett Henry of Lumberton, Crawley Cash of Blacksburg, Fred Patterson and Jack Rohleder of Rockingham. The flowers were in profusion. so many designs, lovely—from friends, and kindred, from the Sans Souci club, from the facul­ty of the schools here, the Am­ erican Legion and others. Interment was in a new plot in Eastside cemetery—on the level section midway between New and Old Eastside. And the grave was covered with flowers and part of them, together with the lilies on the church altar, were carried afterwards to the little Everett cemetery on Le-Grand street, where lie buried his maternal grandparents and mother—she died Jan. 9, 1930: just 17 years ago.